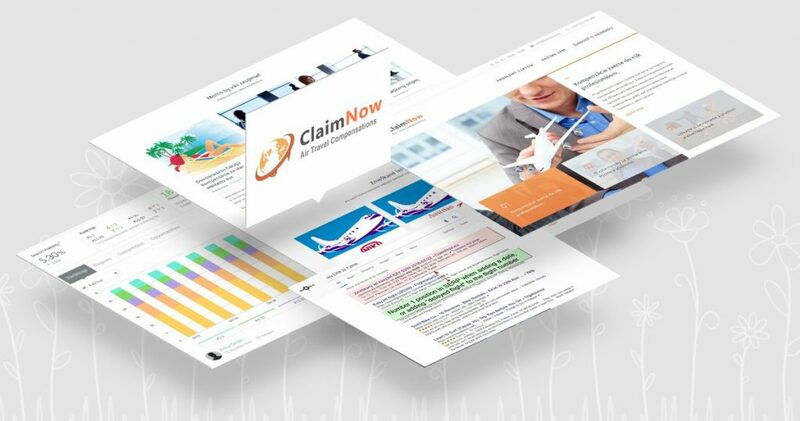 After the launch of the claimnow.eu website in May 2016, we have decided to go beyond the initial onsite SEO that was done as part of the website development project. The company has big ambitions to become number one in the compensation business in the Central Europe and this website represents an addition or a different channel to capture clients to an existing business on click2claim.eu. in summary for any of the 34 tracked keywords (yes, we set preferences, however, I will not go deep into details). Also, we wanted to be better than the primary competitor on the market – the company APRA. 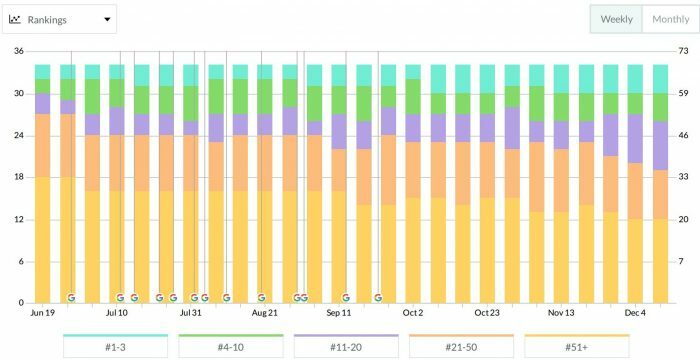 The results of the first keyword position tracking report are depicted at the picture 2. The initial visibility was 1.74% and we already had 2 positions in TOP3 and 4 positions in TOP10. This is a result of our onsite SEO done within the website development project. From now on, the SEO work could start on. The visibility of APRA was 6.76% at the beginning of the project (Picture 3). 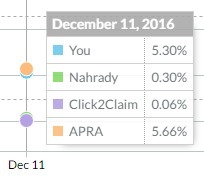 One other competitor – the company Nahrady.cz and the “parent” website Click2claim.eu were added to the competitor tracking so we could compare the rankings with them. Click2Claim, s.r.o. is a Czech Republic based company which specialises in finding solutions to irregularities in airline travel. It was founded in 2010 mainly by professionals from the ranks of former airline employees. The main purpose of its business is providing assistance to clients travelling within the European Union or from the EU to the world in case of delayed flights, missed connection flights, cancelled flights, and other flight irregularities. In addition to the assistance, it acts on behalf of its clients and makes sure the airlines pay the compensation for the problems the clients are entitled for based on the EU regulations. We have teamed up with Click2Claim, s.r.o. 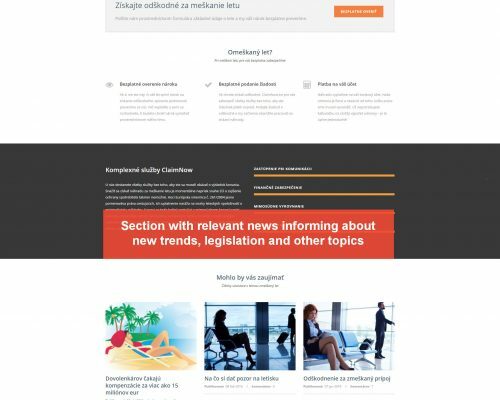 to create a new website which would help them expand on the Slovak market (and other V4 countries as well) and offer an alternative service for clients who might need the assistance with their flight tickets and travel. Our focus has been oriented at onsite SEO predominantly. It is just because that part of your work is the part seen by your website visitors. Google is learning a lot about how people consume the content, navigate and what parameters of website and its content represent value for the visitor. Thus, offsite SEO has been shifted as a minor part of the project, still necessary, but not dominant. 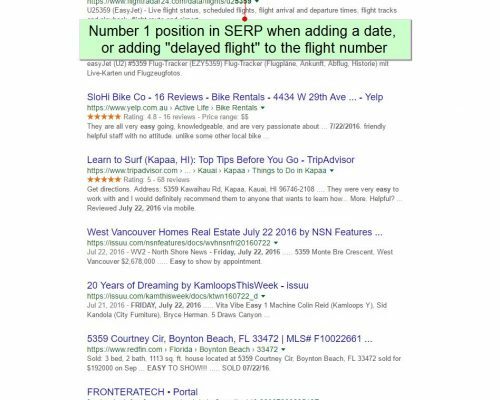 On the beginning, our aim was to achieve an optimum share of all subpages in SERP results, because it is not possibly to optimise homepage for all the keywords. We have ensured that there is enough relevant content on every of these landing/target pages and the content has been improved and tweaked over the time. New articles on relevant topics play an important role in this effort as they prove that we are experts in the topics we are focusing on. Also, we have created a section informing people on details of selected cases the company is dealing with. This has the benefit for people if they see a similar cause has been already processed. Such a page features details on the flight, category of the case (e.g. missed flight or delayed flight), information about the route and current state of dealing with the case. The cases are categorised according the cause and listed in the page informing visitors about this type of problem (Picture 4). 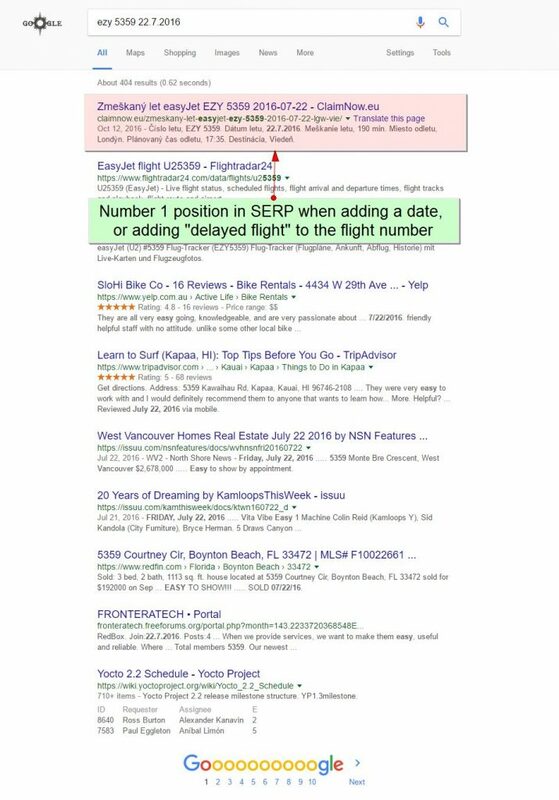 The direct benefit for prospective clients and for SEO is that people searching in Google who experienced the problem with the same flight can find this information easily on the first position and Claimnow.eu can help them get financial compensation for the flight irregularity. 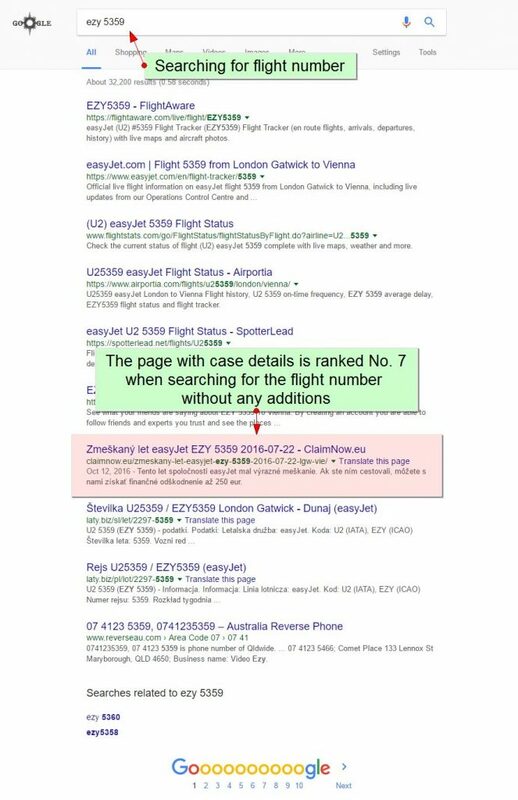 If they search only the flight number as keyword, Claimnow.eu is typically ranked 5-8th (Picture 5). When people add the type of problem (e.g. 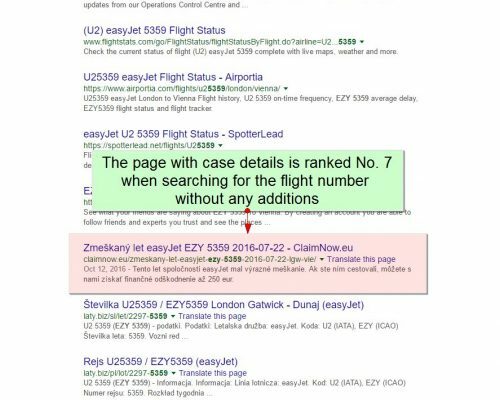 delayed flight) or date of their flight in any format, the page with case details is always ranked first. Also, when adding any other keywords, such as “what to do”, “help” or “compensation” Claimnow.eu is always ranked No. 1 in Google’s SERP (Picture 6). The most important indicator is the search visibility, because it is more complex compared to measuring only TOPx positions. 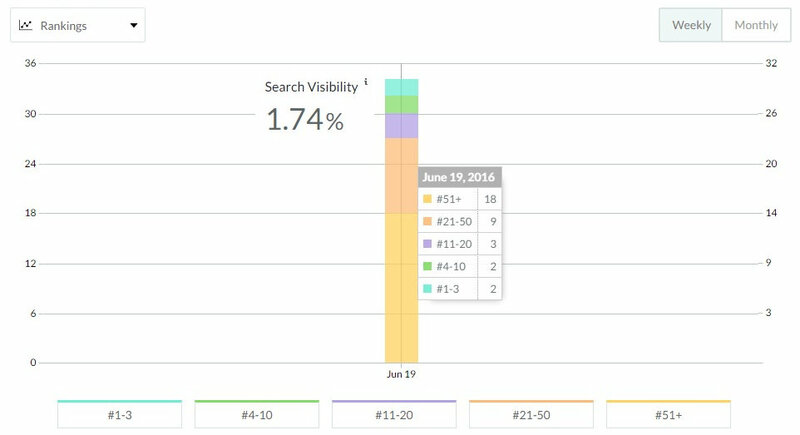 Our work has improved the visibility from 1.74% to 5.30%, which is increase by 204.6%. The trend is positive and we can expect further improvements over the upcoming weeks and months. Ant what about the main competitor – APRA? Their visibility at this checkpoint is 5.66%, so we are almost there (Picture 4). 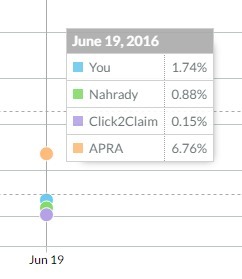 We increased the visibility of the Claimnow.eu website in Google by more than 200% over the first 6 months.